Is your development team tired of writing manual codes or hundreds of lines of code for a minor app update? Are you facing difficulties in launching new features on time due to the long and arduous development cycles? Streebo Low Code App Development Platform – DX Accelerator – will now help you to develop cross-platform applications with real quick turnaround time. Powered by a drag and drop app building tool, DX Accelerator is a set of ‘no or low code’ tooling that allows IT teams and Line of Business to collaboratively and rapidly assemble sleek and intuitive Web, Mobile and Chatbot interfaces. Wiring up any digital property with your enterprise backend like ERP, SAP is now very easy with point and click integration. 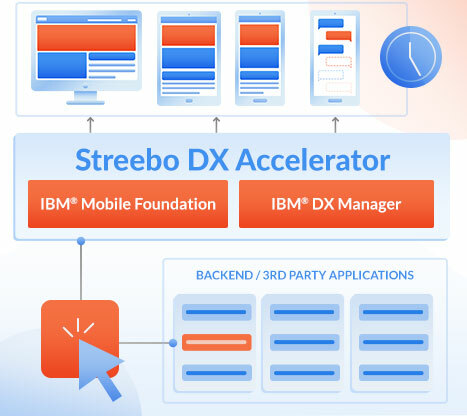 Leveraging industry’s leading IBM® Mobile Foundation and Digital Experience Manager platforms, Streebo DX Accelerator lets you quickly build cross-platform applications (iOS, Android, and Windows) complying with industry standard frameworks, such as Ionic, Angular JS, Sencha, Cordova etc. With a point and click integration interface, these apps can be easily integrated to any CRM, ERP or any 3rd party application. With a single code base, the solution build using Streebo DX Accelerator works on app, web and chatbot interfaces without needing any extra development time.